Happy New Year and welcome to my first blog post of 2017. I wanted to start the new year off by sharing some ideas about childhood drawing I have come across recently. In my pre-school and after school club classes I am privileged to see a broad range of developmental stages in drawing. I absolutely love the freedom and creativity that comes from a child recording the world as they see it, free of inhibitions. My own son has as very distinctive ‘style’ and while his drawings bear little resemblance to the actual thing from a technical perspective they capture the essence as he perceives it perfectly. I thought you might like to see his shark drawings at this point as they are just about my favourite ever art work! I love the way he has tried to draw it from different perspectives despite the challenging nature of the subject matter. I think a lot of adults would have a hard time drawing a shark head on! The expressions are priceless but he has captured what, for him, makes a shark a shark (teeth, eyes and fins). This is such a precious time and one that should be nurtured as it is often all too quickly gone. Many famous artists have often sought to regain the spontaneity and freedom had as children. An article on the Tate website points out that artist John Ruskin, in the 1800’s encouraged artists to try to recover what he called the “innocence of the eye”, to represent nature with the freshness and vitality of a child, or of a blind person suddenly restored to sight. Of course, many of the most successful artists of the 20th century struggled to revert to the naivety and freedom of childhood. Paul Klee apparently found some of his childhood drawings in a box in his parents attic and described them as, “the most significant [I have made] until now”. He had just finished four years at art school but found that his formal training was nothing compared with the ’emotional rawness’ of his youth. In fact, he loved his early drawings so much that he later included them in an exhibition of his work! So, here’s to our offspring’s fabulous, creative, individual and often crazy drawings. And don’t forget to keep them – maybe one day they too will be included in an exhibition! Not long to go now! I was told recently that it is going to be 16°C on Christmas Day so I think it’s fair to say that snow is not looking very likely. Let’s not get downhearted though – we can make our own snow at home and have lots of creative fun along the way. The first idea I wanted to share with you is actually an activity I used at our After School Club this week courtesy of a fab website called It’s Always Autumn. It was very popular and was a great exercise in cutting and accuracy for older children (these children were aged 6 – 8). Following the templates takes the old cut out snowflake idea to another level and I guarantee they will be very pleased with the results. I would encourage them to try the templates provided and then use this as a platform for designing their own. Drawing around a medium sized plate on a sheet of A4 gave us a manageable size for cutting. The other idea is a bit more gloopy but no less fun. Littler ones will also enjoy getting stuck in with this. PVA glue is always a big favourite in our mini classes! You will need a sheet of plastic (I used plastic wallets for clip files cut open), pva glue and glitter. If you can get hold of pva glue in a small squirty bottle, this willl be easier but a spreader will also work. Older children will enjoy following a snowflate template placed under the plastic – you can find loads to download and print online. Younger ones may prefer to just freestyle. Apply the glue in your snowflake shape (or maybe just a simple swirl!) . While the glue is still wet, sprinkle liberally with glitter and shake off the excess. Leave it to dry completely. You should then be able to carefully peel the design off the plastic. These snowflakes look great on a window and should stick by themselves or you could use them as part of a winter picture. Phew! I have just returned from my garage where I have been attempting to get everything ready for classes next week. This is no mean feat at the moment as the garage has been plunged into utter chaos. My normally organised art materials are buried under piles of things normally stored in the shed. The reason? The shed is no more. It was torn down last week to make space for a brand new shiny one (aka ‘log cabin’) that will be my new Art Explorers HQ. Obviously this is all very exciting. It is no exaggeration to say that I am immensely looking forward to organising all of my lovely art materials in my lovely new shed, sorry, log cabin. Sad, I know, but there it is. All this upheaval has made me realise how important it is to have materials ready to use without having to search for them. This is also the case for children. When the creative impulse strikes they need to be able to access what they need to make it happen. I have always made sure that my own children have a ready supply of pens, pencils, paper, glue, selloptape etc and have tried my best to keep it arranged in a tidy, organised fashion. This isn’t always easy but clearly labelled containers (with lids) make it slightly more achievable. In an ideal world, we would all love to have a table and shelves devoted to the artistic endevours of our little ones but for many people this isn’t a possibility. If you don’t have the space for shelves, a transparent shoe organiser such as the one below, makes a great place to keep bits and pieces. And if you find that you can’t devote an area of your house solely to your crafty little one, why not try a trolley like the one below? It can be moved to where ever you need it and keep things neatly arranged and easily accessible. Art storage doesn’t have to be expensive either. I love these ideas of recycling milk containers or tins (I would use electricians tape around the top of the tins to keep them safe). It seems like winter has finally arrived. Time to dig out hats and gloves and spend a good fifteen minutes getting ready to leave the house! On a positive note, we have had some beautiful frosty mornings here over the last few days. Even our bike shed was transformed in to a work of art with beautiful ice-crystal patterns snaking all over it. Of course, if you are small, this kind of weather brings hopes of snow. My son proclaimed that he is certain it will snow on Christmas Day. I didn’t like to dash his hopes but it has been a good few years since we had anything resembling proper so here in sunny Hertfordshire! This week our mini Art Explorers have been getting to grips with salt. We have been busy making Rangoli patterns using coloured salt and Diva lamps with salt dough. I thought I would include this in the blog this week as a few people have asked how I made them and it is so easy it seems only fair to share! Salt Dough. This is great; similar to playdough but it can be baked so you can keep all of those fantastic creations. Children love to paint it once it is baked. My own children made play food such as fruit and veg in this way. A great exercise in observation as well as modelling! Mix together to form a dough…voila! Once again, little ones will enjoy the mixing part. Bake creations for around 1 hour at 100°C depending on size. Coloured Salt. Place required amount of salt in a plastic tub, add a squirt of paint, put on the lid (firmly!) and shake vigorously. Children will enjoy making this – they will see the colour gradually spread throughout the salt as they shake. Spread out on a tray to dry for a few hours. Once it is dry it can be used to make pictures using glue (such as our Rangoli patterns). For really little ones it is a great sensory experience without the glue. How about hiding some objects in the salt? Sprinkled Salt Effects. Salt absorbs liquids and this can be used to great effect on a piece of art work. Liquid watercolours work best for this but ordinary paint would work too. Paint an area and then sprinkle with salt. Allow to dry and shake off the salt. Where the salt has been will be a lot paler than the rest of the picture. This is a great way of achieving a night sky or watery effect. ‘Magic’ as far as little ones are concerned! Isn’t it strange how sometimes your memory is triggered for no apparent reason? Out of the blue, the other day, I suddenly remembered how much the children at a school I used to teach at loved making ‘stained glass biscuits’. This is a fantastic activity for any time of the year but is particularly great now with Christmas approaching and Diwali celebrations taking place. It is also easy to do and pretty much guarantees great results. What’s not to love? Beat the butter and sugar until thick, pale and creamy. Sift the flour, and mix in the butter and sugar together. Stir in the milk, then knead the mixture to form a soft ball of dough. Roll out onto a floured surface until about 0.5 cm thick and cut it into shapes with biscuit cutters. Arrange on a tray lined with baking paper. Cut a hole in the middle of each shape and put a sweet (or half depending on size) inside. Bake at 180° C ( 160° C fan) for around 15 minutes. Allow to cool and harden on tray before moving to a wire rack. You can use any shaped biscuit cutters your little one takes a fancy to…there are no rules here. Encourage squishing and squeezing of the dough. It might not be recommended by professional bakers but it certainly helps to strengthen little fingers! Why not try putting a couple of different coloured sweets in the hole and seeing what happens as the colours mix together? These also make fantastic Christmas tree decorations. Just remember to put a hole in the top of the biscuit before you bake it. Enjoy! Autumn is such a lovely time for art and craft activities. There is such an abundance of free materials just ripe for the taking! Whilst out on my run this morning I was struck by just how many different types of leaf were littering the path between Hertford and Ware. Big ones, small ones, smooth ones, spiky ones! Such a variety to intrigue and inspire inquiring minds. There are numerous ways to make creative use of this bounty and we will be using leaves in several ways in our classes next week. I couldn’t resist (get it?!) having a go at some wax rubbings with some of the leaves I found. Small children will often need a bit of help to get started with this as holding the leaf still and rubbing with the crayon at the same time is hard for little hands. You could try blu-tacking the leaf to the table to stop it slipping if this is a problem. They will also need to be shown how to use the crayon on it’s side to cover a large area which can be challenging. However, once they get they hang of it, the results are magical. It is lovely to see their faces as the leaf appears for the first time on the paper. For even more magical results, try rubbing with a white crayon or candle and then painting over with some runny paint or liquid water colour. The leaf will appear before their very eyes! For children who are getting to grips with scissors, this is a great opportunity to practice cutting out. Why not create a line of leaf bunting and practise those threading skills as well? There are so many options and all you need is a few leaves and a crayon. Art on a budget at it’s best! ALWAYS put down some sort of covering on the table or floor (newspapers are good as they can just be rolled up and thrown away). Use a tray. At Art Explorers we use Tuff Spot trays which I can not recommend highly enough. You can buy them at DIY stores for around £13; they are sometimes called cement mixing trays. Failing that, use a baking tray or similar. Just something with sides! Provide only small amounts of glitter, topping up when needed. Small child + large tub of glitter = disaster waiting to happen. Use contact paper (sticky backed plastic) for your glitter creations. This is much less messy than glue and it contains the glitter more effectively. It can also be used to collect unused glitter. Use a ball of play-dough to collect any stray glitter. Children will love rolling it around to make a sparkly ball and in doing so they will have done the cleaning up for you! If you are still worried about glitter in your house…try craft in the (empty)bath! The only place that glitter will be going is down the plug hole. I don’t know about you but here at Art Explorers HQ we have been getting rather excited about Halloween. My own mini explorers came home from the grandparents house the other day with a beautifully carved pumpkin each. Poor Grandad had been very busy! They had apparently designed the faces and then Grandad had carved them out. This is the annual problem that parents of any child below knife-wielding age face…kids get so excited about carving a pumpkin only to discover that it is impossible/dangerous for them to do it themselves. Cue parents up and down the and covered form head to toe in pumpkin detritus with RSI from carving ridiculously intricate features (‘no, it needs to be a STAR shape!’). Accordingly, I have been having a think about alternatives. Although it is lovely to have a pumpkin glowing outside your house, it is also nice to have an activity that busy fingers can get on with independently. Here is a great idea that will also help develop those fine motor skills. Children love wrapping activities and googly eyes so this is perfect! And here’s a messier one but they look amazing. Just grab your paint and off you go! Hi folks. I have been busy recently planning for our mini classes next half term and I have come across so many fantastic ideas that it seems a shame to keep them to myself! I am going to try to use this blog to share at least one great arty, crafty activity each week that you can try at home with your little ones. If you make something great or just have a lot of fun doing it (that’s the main aim at the end of the day) the it would be great to see the results. You can share them to our facebook page or comment below and maybe let us know what worked well (and what didn’t!). The aim is to get a little community of like-minded parents and carers sharing hints and tips and getting creative. So, as Halloween is just around the corner, it seems fitting that the first offering is pumpkin based! This is a great activity for developing your little one’s scissor skills. People are sometimes surprised that we have ‘real’ scissors at our mini classes but learning to use scissors safely is an important skill. It is also fabulous for developing fine motor skills and hand-eye coordination. All you need for this one is some green and orange paper, scissors, pen, ruler and a couple of split pins. 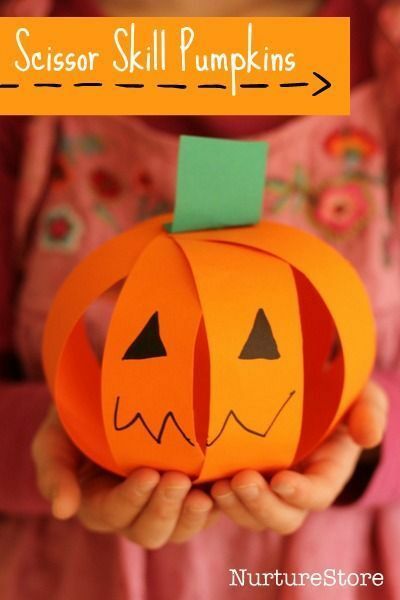 Make lots in different sizes and use them to get your house ready for the 31st. Let me know how you get on!